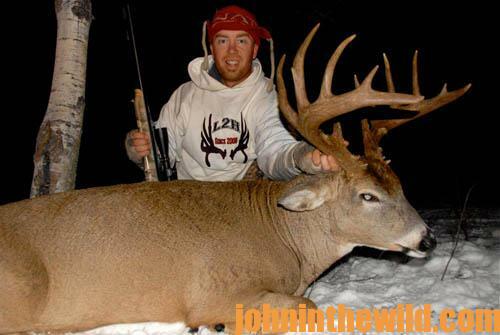 John’s Note: Kelsy Robbins, 1/2 of the “Live 2 Hunt” TV Show has lived in Delisle, Saskatchewan, Canada, her entire life. She co-hosts her and her husband Cody’s TV show. Kelsy’s a mom, a wife, a business partner, a barrel racer and an avid hunter – far more than the person you see on TV. I was a city girl, but I’d always had horses and been in the outdoors. My dad, Arley Claypool, was always a hunter and also was a white-tailed deer guide for most of my life. I’m the youngest of four girls, so my dad didn’t really have a boy to take hunting with him. Like my sisters, I didn’t want to go hunting. I didn’t like hunting, and I didn’t like for my dad to go hunting. I was about as anti-hunting as you could get. When my dad brought home animals he had killed, I was livid with him. Finally, when I was 16-years old, my dad convinced me to go with him on a hunting trip, after promising he’d leave his gun in the truck. We went out and sat down by a fence line together. We spotted a couple of does and fawns out in the field in front of us. I was sitting with my back against a tree with my legs out in front of me. Something spooked the deer, and the does and fawn started running toward us. The does passed by close, and the fawn came by so close that it jumped over my legs right in front of me. I experienced the most adrenaline rush I ever had experienced in my life. After that, I went with my dad hunting for the next 2 years. I thought hunting was the most-exciting thing I’d ever done. Dad never killed an animal in front of me, but I was open to the idea that he might. I really loved the experience of being out in the wild with my dad, and the adrenaline rush I got when I saw deer. My dad started guiding for nationally-known hunter and TV host Jim Shockey. Cody Robbins and I had grown up together when we were kids, but then we lost touch with each other. When my dad and Cody started working together for Jim Shockey, my dad asked Cody to take me hunting. Although I had a tag and a gun, I hunted with Cody for 3 years before I ever found a deer that I wanted to take. I never saw Cody as a sweetheart. He was just a really-good friend – my dad’s friend. He didn’t seem like he had a problem taking me hunting. During that time, I learned why deer had to be harvested, and I understood how hunters’ dollars helped protect and make sure there were plenty of deer. 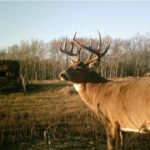 I enjoyed watching deer on trail cameras, seeing them in the wild and seeing how excited Cody would get when he saw a nice buck. 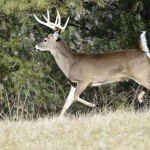 Finally, I decided I was going to shoot one of these bucks. 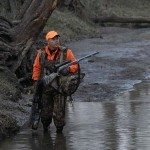 On the hunt for my big mule deer, I was hunting with a muzzleloader. We had been following this big mule deer buck, and the deer bedded down on the side of a hill. Finally, the buck stood up 120 yards from me. 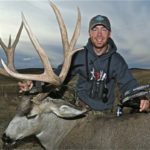 Once the mule deer buck stepped out in front of me, I was hit with an adrenaline rush that’s hard to describe. I was so excited I didn’t remember taking the shot, and I completely missed the buck. “Where did you hold the crosshairs before you shot?” Cody asked. “I don’t know,” I told him. “I just shot.” The buck didn’t run off. He didn’t seem to know from where the shot had come. Cody took the muzzleloader and reloaded it. As I watched, the buck walked farther away from me, but he wasn’t spooked. 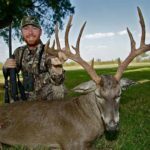 When I shot the first time, the muzzleloader kicked me hard – coming up and hitting me in the forehead. Cody ranged the deer at 190 yards. Next I put the crosshairs on the deer, turned my head away, so the gun wouldn’t hit me on the forehead again, closed my eyes and pulled the trigger. My bullet hit the mule deer right in the heart. When that big buck dropped, Cody jumped up and started screaming and jumping and picked me up and slung me around. I was as excited as he was. The hunt was amazing! 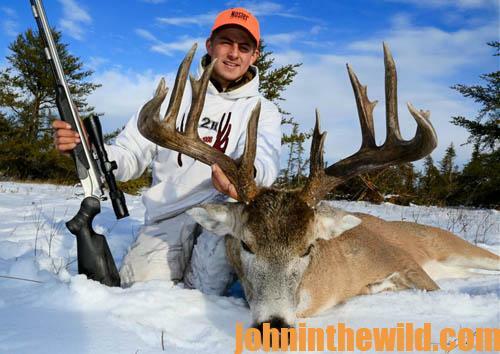 Cody filmed it for “Jim Shockey’s Hunting Adventures” TV show. When Cody and I first started hunting together, I had a boyfriend, and Cody had a girlfriend. Often, we would talk about our date life. Cody would call me at work and at 2:00 am when he was fighting with his girlfriend. He and I gave advice to each other. That’s part of the reason I put Cody in the friend zone, because we talked about things that friends discussed. Cody and I had been hunting together for a year after I took my big buck, and I had tucked him away in the friend zone. He was my hunting buddy and a good friend, but that was all. Cody flirted with me, however, I never saw it as flirting. I always thought of him as a nice friend. I should have picked up on the fact that Cody wanted our relationship to be more than hunting buddies. We’d be sitting in a blind from before daylight until after dark, and Cody would ask, “Are your feet cold?” I’d answer, “Yes.” Then, he’d say, “Well, take your boots off, and I’ll rub your feet and get them warm for you.” I’d say, “Okay.” Of course, when we got married, the foot rubbing went out the window. One day we were hunting together, sitting on the side of a hill, and Cody told me he’d been in love with me since the first time we hunted together. “One day I’m going to marry you.” I thought, “Oh, my goodness, this is awkward. We’ve never even dated. We’ve only hunted together.” I didn’t know what to think, what to say, or how to react when Cody told me he loved me. This whole episode was going to take me a little while to understand. I said, “What? We’re good friends.” Even though I didn’t know what to say or how to react, Cody and I were such good friends we continued to hunt together. I don’t think we ever went on a date – we just kept hunting together. We both had horses. I was barrel racing, and Cody was team roping. So, when we weren’t hunting, checking trail cameras or baiting deer, we were on the rodeo circuit. We had very little time for dating. Our dates were when we went hunting, scouting or rodeoing together. Once Cody first started thinking about having his TV show, he’d call me in the wee hours of the morning and ask me to help him think of a name for the TV show. I wasn’t surprised he wanted to have his own TV show. I thought it was a natural progression for his career. He loved working with Jim Shockey; he loved hunting; and he loved shooting video. Cody and I talked about everything in both our lives when we were just friends. Cody was just starting his TV show, “Live 2 Hunt,” when we decided to be sweethearts instead of hunting buddies. We were really busy trying to put everything together for the TV show. After about 9 months, Cody proposed, but there just never seemed to be time to plan a wedding. So, we were engaged for 3 years before we married. I planned a wedding two different times, and we had to cancel both times. Once there was a trade show we had to attend on the day we planned to get married. The second time we had set a date for our wedding, I drew a tag for a mountain goat hunt. I couldn’t give up that tag and that hunt just to have a wedding. I also knew that Cody had left a good job with a regular paycheck and was now trying to make it on his own. The future was scary. I knew how much work and how much debt starting his own business had been for Cody. So, the thought of marrying him was financially scary. My dad had a western wear store where I’d worked since I was 13, and then I managed the store for my dad. Actually, I had thought that I would take over my family’s business. I knew how to run a business, and the kind of debt you had to incur to be successful. But when you’re in love, things that seem difficult don’t seem as difficult. My mom and dad always had loved Cody since we were small children. When we were just friends and hunting together, Cody would come over to my home for supper. I guess he was part of the family before he was officially part of my family. Once the shows and hunts were over, we did find time to get married. I first started hunting with Cody when I was 19, and he told me he loved me and wanted to marry me when I was 24. We finally got married in 2012 when I was 29. From the beginning of my relationship with Cody until now must be the most-weird relationship I ever had been in previously. But our relationship has been one of the most-fun parts of my life. Part of the reason is because Cody is one of the most-upbeat persons I ever have known. I’m just the opposite. I worry about every little thing, and I get stressed out fairly easily. Cody just sort of balances both of us. For information on making jerky from your deer to provide a protein-rich snack, you can download a free book, “How to Prepare Venison Jerky: The Ultimate Snack Food,” from http://johninthewild.com/fee-books.